Good Morning! Thank you for sharing this message…I want to turn this lesson into a skill: ) God’s blessings always!!! I needed this reminder! 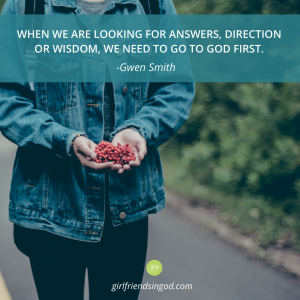 I’m seeking God first. Today. And the days ahead! It’s amazing how we sometimes manage to take God out of the simplest tasks even subconsciously! Something as simple as the ask of a question we usually defer to everyone but Him! Although not intentional, we do it. I think this devotional brings to my awareness who should I be posing questions to? Thank you for this push to be aware of who is priority when it comes to these simple life things? Boy, do we need this devotional after looking at this am news! Thanks so much for the practical “plumber’s” story! How often we are always in a situation of frustration and looking for answers right in front of us. We all need to stop being “chicken little” and realize “someone” greater is there, for us!